Us & Co is very excited to announce our brand new business centre in St. Stephen’s Green in Dublin 2, which will be opening its doors in October 2018. Our contemporary, professional and expertly refurbished building at 5 Schoolhouse Lane East offers both private offices and flexible co-working in an open-plan environment. 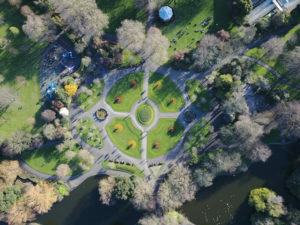 At both our London Monument centre and in Dublin 2, we pride ourselves on providing our members with a five-star-service in five-star surroundings. By way of introduction to Us & Co Dublin, this article will tell you the story behind our decision to choose Dublin as the home of our second business centre, the impact of Brexit on business in the Irish capital and why we believe the city has such strong potential. We were keen to grow the Us & Co brand in Dublin, inspired by how well the city has recovered from the problems it suffered following the financial crisis ten years ago. The widespread economic downturn of 2008/2009 hit Ireland especially hard. It was the first state in the eurozone to officially enter recession, with the Irish Stock Exchange general index plummeting to a 14 year low and the unemployment rate rising from 6.5% to 14.8% in just the space of a year. Dublin, in particular, saw significant unrest – with hundreds of thousands of people demanding that the government to do something about the slumping economy. Fast forward to 2018 and Dublin is a thriving city, with lots of potential for further growth. It is home to many international companies which are expanding their operations there, making use of the well-educated workforce. In recent years, Dublin has also established itself as a desirable location for the tech sector. Among others, Google, Amazon, Facebook, Twitter and Airbnb have all set up headquarters there, spawning growth in other businesses providing services to them. With current Us & Co members coming from a wide range of sectors and businesses, including the tech industries – we realised that Dublin offers a great opportunity for us. The impact of the UK referendum result is already noticeable in the city, as – for many companies – Dublin is the best way to access the European Union. The uncertainty of Brexit has meant that many international companies – big and small – have taken the decision to set up bases in Dublin, in order to ensure they can maintain trading relationships within the EU in the medium and long-term. It is estimated that close to 100 large banks, insurers and law firms are considering Dublin as their EU base and the last two years have seen 1,317 lawyers from England and Wales register for the Roll of Solicitors in Ireland – dubbed an influx of ‘Brexit refugees’. Small businesses, too, are being lured by the Irish city in the wake of Article 50. Back in December 2017, Croke Park stadium in Dublin hosted a dedicated workshop for small businesses around the topic of ‘practical help to navigate Brexit’, which was attended by over 400 small firms. Companies like these most often want office space with a commitment of two to three years initially, with the opportunity to expand further down the line – which is exactly what we provide at Us & Co with our serviced offices. In fact, we are already seeing direct evidence of this, as our first two clients to to take office space at 5 Schoolhouse Lane have selected the Irish capital for this very reason. What Is The Dublin Co-Working & Private Office Market Like? The growth of business in Dublin has had an unsurprising knock-on effect on the growth of co-working, hot desking and private office hire in the city, and this market is currently flourishing. As more and more big businesses move to the capital, so too do SMEs, start-ups and freelancers, bringing with them a demand for flexible, professional working space. The Dublin co-working and private office market is therefore at a really exciting point right now, making the city a clear choice for the Us & Co brand. 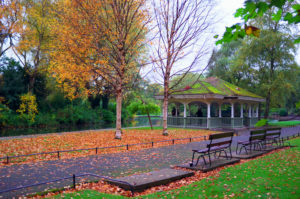 St. Stephen’s Green is arguably ‘the Mayfair’ of Dublin. It is an extremely prestigious area in which to have an office, favoured by the banking and financial services industry. We expect many of our clients to come from these sectors. 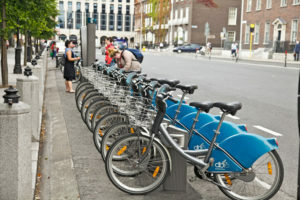 In addition, the Irish Government, Trinity College and Grafton Street, Dublin’s prime shopping street are all within five minutes’ walk – as are numerous bars and restaurants. This makes the area very attractive to employers and employees of every business and profession and we expect to attract a wide variety of clients. What Makes Us & Co Dublin Different From The Competition? Our priority is to offer our members a ‘pro-working’ experience – high quality service, combined with our upmarket design identity differentiates Us & Co from our competitors. How To Enquire For Private Offices Or Co-Working At Us & Co Dublin? 5 Schoolhouse Lane East, Dublin 2 officially opens in October 2018. If you are interested in enquiring about our private offices, fixed desks, hot desks, meeting rooms or event space, please use our contact form to get in touch with the Us & Co team, or give us a call on 020 3031 3535. If you wish to come and have a look around and see the facilities, please book a tour here.